Maximum efficiency. Compact design. Up to 70% quieter. 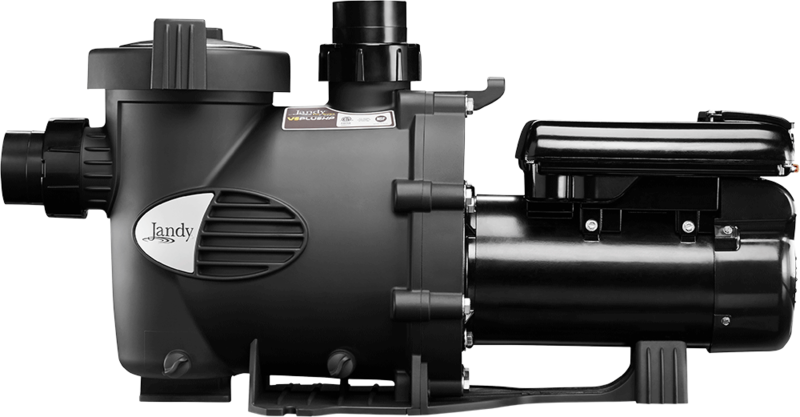 VS PlusHP is a high performance, energy efficient pool pump, in a compact body. VS PlusHP is a high performance, energy efficient pool pump, in a compact body. Save over $1,100 in electrical cost savings vs. single-speed pool pumps. * The VS PlusHP is up to 70% quieter for a peaceful backyard. * Based on a 28,000 gallon pool with 2 turnovers per day at an average power cost of 0.185/kWh; when tested in accordance with the applicable requirements of 10 CFR 429. 40% Larger strainer basket than the leading competitor for greater pool owner convenience and improved efficiency when loaded with debris. Complies with Appliance Efficiency Standards - (CEC Title 20 & ANSI®/APSP-15) and qualifies for power rebates, where offered. ENERGY STAR certified. *Also available without interface, for applications with AquaLink® RS, AquaLink PDA, or AquaLink Z4 control systems (VSPHP270AUT). VSPHP270JEP 2.7 230VAC 2,400 W Min. 15A/14AWG 50 lbs 30 3/8"
VSPHP270AUT 2.7 230VAC 2,400 W Min. 15A/14AWG 50 lbs 30 3/8"
***Always follow local building and safety codes for pipe sizing and guidelines. 1. Check the suction side piping union. While the pump is running, try to tighten the union. If this does not stop the air leak, turn off the pump. Loosen both unions and slide the pump out of the way. Remove, clean, and re-install both union o-rings. 2. Reposition the pump next to the piping and secure the union nuts to the pump. With clean union o-rings, and-tightening of the unions should create a seal. If the unions still do not seal, gently tighten with a large pair of tongue-and-groove pliers. Do not over-tighten. Bubbles are present in the pump basket. 1. Air is in the system. Check the pool or spa water level to ensure that it is at the proper level and air is not being drawn into the suction piping. If the water is at the normal level, turn off the pump. Turn the lid's locking ring counter-clockwise until 'START' aligns with the ports. Remove the lid and check for debris around the lid seal seat OR improper installation of the lid seal, as either condition will allow air to leak into the system. Clean the lid seal and replace it on the lid. Replace the lid on the pump housing. Align 'START' with the ports and turn the locking ring clockwise until 'LOCKED' aligns with the ports. Hand-tighten the lid to make an air-tight seal. Do not use any tools to tighten the lid. Turn the pump back on. Controller displays “Pump not connected”. Fault message appears on controller display. 1. Fault condition exists. View fault message on controller and correct fault before proceeding. If unsure how to correct fault, contact Zodiac Technical Support at 800.822.7933. 4. Fault condition exists. View fault message on controller and correct fault before proceeding. If unsure how to correct fault, contact Zodiac® Technical Support at 800.822.7933. Reduced flow being returned to pool and/or less water being pulled in by skimmer. 1. Verify that skimmer baskets, pump basket and other screens are clean. Clean as necessary. 2. Check filter and clean as necessary. Check valve positions. Adjust as necessary. will affect the proper operation of the cleaning system. electrician check for loose connections and check the voltage at the pump motor while it is in operation. The voltage must be within 10% of the motor's data plate rating. If the voltage is not within 10%, contact a qualified electrician and/or the local power service provider. 1. This is caused by a damaged or failed mechanical seal. Replace the seal. 1. It is possible that debris is caught in the pump impeller. The pump impeller moves the water, and the vanes in the impeller can become blocked with debris. the voltage at the pump motor while it is in operation. The voltage must be within 10% of the motor's data plate rating. If the voltage is not within 10%, contact a qualified electrician and/or the local power service provider. 3.Pump seal is leaking air. Have a qualified service technician replace the seal. Variable-Speed Controller LCD is not displaying information or pump LEDs are not illuminated. An ENERGY STAR product to save you $.